We’d love your help. Let us know what’s wrong with this preview of Life from Scratch by Sasha Martin. Witty, warm, and poignant, food blogger Sasha Martin's memoir about cooking her way to happiness and self-acceptance is a culinary journey like no other. Over the course of 195 weeks, food writer and blogger Sasha Martin set out to cook—and eat—a meal from every country in the world. 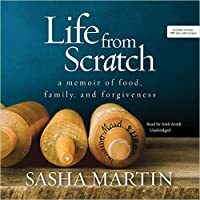 As cooking unlocked the memories of her rough-and-tumble childhood and the loss and hear Witty, warm, and poignant, food blogger Sasha Martin's memoir about cooking her way to happiness and self-acceptance is a culinary journey like no other. Over the course of 195 weeks, food writer and blogger Sasha Martin set out to cook—and eat—a meal from every country in the world. As cooking unlocked the memories of her rough-and-tumble childhood and the loss and heartbreak that came with it, Martin became more determined than ever to find peace and elevate her life through the prism of food and world cultures. From the tiny, makeshift kitchen of her eccentric, creative mother, to a string of foster homes, to the house from which she launched her own cooking adventure, Martin's heartfelt, brutally honest memoir reveals the power of cooking to bond, to empower, and to heal—and celebrates the simple truth that happiness is created from within. To ask other readers questions about Life from Scratch, please sign up. Such an amazing woman! Is Sasha still in Tulsa, and what is her next project? This is a book about Sasha's terrible childhood that she's never got over and goes on about endlessly. I didn't really feel she had forgiven her mother for having given her and her brother away (and thereby been the cause of her brother's suicide) but that she wanted her mother in her life enough to put it to one side. The mother comes off looking good with a strong personality and sense of style and you would scarcely believe how self-centred she was, just what little concern she had for her ch This is a book about Sasha's terrible childhood that she's never got over and goes on about endlessly. I didn't really feel she had forgiven her mother for having given her and her brother away (and thereby been the cause of her brother's suicide) but that she wanted her mother in her life enough to put it to one side. The mother comes off looking good with a strong personality and sense of style and you would scarcely believe how self-centred she was, just what little concern she had for her children, I hated her and I never forgave her. There wasn't much about food, a little bit about family, pseudo-family and newly-discovered half-family, children of the father who never ever wanted her. It was an unremittingly sad book. I felt very sorry for the author and felt she clutched at straws for love and acceptance from anyone who might validate that she was a lovable human being. I hope she's got a happy life now. Unfortunately, the book never lived up to the promise of the beautiful cover; it was a drudge to read. I couldn't see what it was author was a blogger and all her subscribers joined up to vote? There just isn't enough substance here to lift the book out of mediocrity to me. It's hard to make the jump from blogging to a full-length book, the media and audience expectations are so different. I wish the author well. Written when reading the book. (view spoiler)[ I went back to this. Can't read Greek history all the time. I'm having the same problem with the book as I did before. But in reverse. Before I couldn't engage with the author because of her lack of emotion with extreme events. Now it's overdoing it. Years down the road and we're still obsessively grieving. I am wondering when food makes it's appearance. I'm a third of the way through the book. It still hasn't. So it is a memoir. But no food. Family? Yes but they are her foster/adopted family and she doesn't have any emotion towards them whatsoever, only towards her mother who gave her up 'for her own good' and pops up every now and again. I must have missed exactly why she gave her up as all I could see was that they were living on the breadline. Her siblings, all grown up, don't want to take responsibility for her. Forgiveness? Well I suppose we will get to that. Our relationship with food is complicated. Never is that more clear than with this memoir of a young woman's journey to self acceptance. The author chronicles her life with some of the recipes from her childhood and most from her career as a food blogger. Like most of us, her life's journey is complicated.And she finds herself leaning too heavily on others for support. Finding her own footing and becoming emotionally self sufficient is the task she struggles with.As her adult life evolves, so d Our relationship with food is complicated. Never is that more clear than with this memoir of a young woman's journey to self acceptance. The author chronicles her life with some of the recipes from her childhood and most from her career as a food blogger. Like most of us, her life's journey is complicated.And she finds herself leaning too heavily on others for support. Finding her own footing and becoming emotionally self sufficient is the task she struggles with.As her adult life evolves, so does her relationship with food and family. I like reading a chapter or two of a ‘foodoir’ (as Sandra Gilbert dubbed foodie memoirs in The Culinary Imagination) over weekday lunches. Martin writes well and I enjoyed this book overall, but at times you may become frustrated and ask “where’s the food? !” That’s because the makeup of this book is: Misery Memoir – 70% / Global Table Adventure blog – 30%. Martin never remembered her father; she and her brother Michael grew up in Boston with the I like reading a chapter or two of a ‘foodoir’ (as Sandra Gilbert dubbed foodie memoirs in The Culinary Imagination) over weekday lunches. Martin writes well and I enjoyed this book overall, but at times you may become frustrated and ask “where’s the food? !” That’s because the makeup of this book is: Misery Memoir – 70% / Global Table Adventure blog – 30%. Martin never remembered her father; she and her brother Michael grew up in Boston with their single mother in poverty, although she was so clever with shortcut and thrifty meals that Martin never realized they were poor. Food was always a way of connecting to their Italian and Hungarian heritage. “In those days food was never just sustenance; the very act of cooking knit our disparate lives together,” Martin remembers of her brother and half-siblings. Their mother struggled to cope, and the kids were taken into foster care when Martin was nine. Their new guardians, family friends Patricia and Pierre, moved the family to Atlanta, then to France and Luxembourg. In her rebellious teenage years, Martin felt cut off from her own mother and failed to get Patricia’s attention and acceptance, especially after the tragic sequence of events relating to her brother Michael. Now, FINALLY, the blog comes into the picture. Martin had the idea to cook dishes from every country of the world. At the rate of one feast per weekend, the blog project (Global Table Adventure) would take four years. Luckily she manages to give a fairly comprehensive overview of the cooking she did over those years. (This is much better than Reading the World in that it does make an attempt to tie in the blog content.) It was impressive to me to see how diverse Tulsa is – Martin was able to find most of her ethnic ingredients at local specialty markets. The irony of the project was that Keith was an extremely picky eater, and now he had to make his way through lots of curries, flavorsome stews, and dishes that you eat with bread or with your hands. Martin almost poisoning herself with poorly processed cassava root for the Angola meal. Some of the food is more recognizable of course, including the German 21-layer cake her mother always made them, and a Sacher torte from Austria. Towards the end of her blog project, Martin had a dream of making her virtual ‘global table’ a physical reality. She recognized that, especially with her family spread around the country, she needed community right there in Tulsa if she was to stay. This meant, at the very least, finally meeting their neighbors, who she dubs “The Beards.” On a larger scale, it came to fruition through her huge Tulsa-based exposition of over a hundred countries’ cooking, aided by local chefs. I might have liked the misery memoir material to have been condensed a bit more to make more space for the blog project (or for the whole book to be cut by 30% or more), but this is still a good one for foodoir fans. I reckon Martin could write a fun nonfiction book about her culinary travels, or maybe a novel along the lines of The Particular Sadness of Lemon Cake, in which food and emotions are inextricably linked. Julie and Julia was a delightful food blog project turned book turned film; I could see Life from Scratch becoming a movie, too. •	Elsewhere by Richard Russo also features a characterful mother joining the author for a road trip west. •	Delancey is more feel-good foodie lit (also, Molly Wizenberg is from Oklahoma). On the surface, Sasha Martin’s memoir is about cooking her way around the world and the process of blogging about it. But more than that, this book is about how the author puzzles through the hand she had been dealt, complete with a difficult childhood, and the road to making peace with herself and her life largely through food and cooking. Sasha’s book put me in mind of the writings of Jeannette Walls and Ruth Reichl, as well as Wild by Cheryl Strayed. Her writing is clear and conversational. Th On the surface, Sasha Martin’s memoir is about cooking her way around the world and the process of blogging about it. But more than that, this book is about how the author puzzles through the hand she had been dealt, complete with a difficult childhood, and the road to making peace with herself and her life largely through food and cooking. Sasha’s book put me in mind of the writings of Jeannette Walls and Ruth Reichl, as well as Wild by Cheryl Strayed. Her writing is clear and conversational. The recipes throughout the book, which are just a sampling of what is available on her blog Global Table Adventure, seem within reach of the average cook who wants some adventure. She is a person who has had the courage to tell an authentic story of learning to make peace with herself and her past, in order to be able to live in the present and the future. Personally, reading this book gave me courage to accept some things in the past for which there is no explanation. Probably 3.5 stars total --3 for the first half and 4 for the second half. 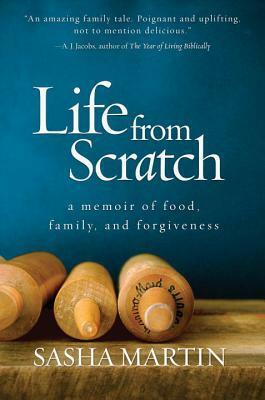 "Life From Scratch was an interesting book for me. I found myself avoiding reading it for the first half-ish of the book because Sasha Martin's depiction of her childhood and the many adults who let her down during it--starting with her mother who essentially abandons her children to the foster care of friends, and combined with the suicide of her beloved brother--was a downer. Martin's writing won me over in the end, and the later part of the book as she finds her place in the adult world and begins cooking her way through the recipes of the world was more enjoyable--even as she worked through her fear of abandonment and other issues of her childhood. Forgiveness is in the title and I was impressed by Martin's capacity for it--although in my opinion, she takes on too much of the blame for some of the circumstances--especially with the relationship with the family-friends (Pierre and Patricia Dumont) who fostered her for her preteen and teen years. I'm not a parent, nor have I ever fostered a child so I am not truly qualified to judge, but I found myself almost angrier at them more than her mother at times, (particularly Patricia) for some of the actions they took and their inability to put Martin's needs in priority and to seek to understand her in a mature way as the adults who took on her care. Martin was able to forge and maintain an adult relationship with her mother but not the Dumonts, and I give her much credit for even trying with both. As a food blogger myself, I really enjoyed reading about Martin's project to cook and blog recipes from each country of the world, once a week for 195 weeks and was surprised I was not familiar with her project or blog (Global Table Adventure) as cooking global flavors is something I love to do and is of great interest to me. Hearing about her successes and reading her descriptive food writing made this part of the book fly by and caused me to check out her blog for more of it. The entire memoir has about 30 recipes worked in throughout the chapters; many are family recipes and others are favorites from the project. " This is not a book that I intended to read. I was looking up for something else in goodreads when the title caught my eye at the recommendations column. Growing up, I never had a loving relationship with food or cooking. To me, cooking was a burden borne by women as a norm of patriarchal society. Food made me fat, so hiding at girl’s toilet to avoid breakfast was my accomplishment in boarding school. However, over the years my perception towards cooking and eating has changed to a degree where I This is not a book that I intended to read. I was looking up for something else in goodreads when the title caught my eye at the recommendations column. Growing up, I never had a loving relationship with food or cooking. To me, cooking was a burden borne by women as a norm of patriarchal society. Food made me fat, so hiding at girl’s toilet to avoid breakfast was my accomplishment in boarding school. However, over the years my perception towards cooking and eating has changed to a degree where I find food memoirs and movies like Julie and Julia, quite comforting. Now cooking to me is gradually becoming as Sasha Martin beautifully describes: "a walking meditation". Life from scratch is a catchy title with an equally catchy theme where the author cooks dishes from countries all over the world! I was expecting a bunch full of exotic recipes but as I started reading it, I got drawn more into the inner life of the author. The first three parts in the book are my absolute favorites. I found myself in tears at times and in amazement the other times, wondering how much hardship some people endure in reality. Aren't those people who find bliss and empowerment despite life's struggle, so beautiful? Definitely, Martin's writing reflects that beauty and wisdom. Mostly memoir, with food recipes sprinkled in. When I first heard about this, I thought it sounded like a fascinating read. A food blogger's memoirs of her childhood and what led her to food blogging recipes from around the world? Sounds fascinating! Unfortunately, that wasn't it. It took FOREVER for me to get this book from the library, and so I was thrilled when I finally got it. Since it had been so long I hadn't remembered what drew me to the book in the first place and I read it without bot Mostly memoir, with food recipes sprinkled in. When I first heard about this, I thought it sounded like a fascinating read. A food blogger's memoirs of her childhood and what led her to food blogging recipes from around the world? Sounds fascinating! Unfortunately, that wasn't it. It took FOREVER for me to get this book from the library, and so I was thrilled when I finally got it. Since it had been so long I hadn't remembered what drew me to the book in the first place and I read it without bothering to refresh myself. Her childhood began okay, essentially being raised by a single mother (her and her brother Michael's father abandoned them around the time of her birth). But being a single mom is never easy, and eventually the children are taken into the foster care system, where they are shuttled in a few different homes of varying qualities. Michael is sexually abused by a priest and quite possibly at one of the foster homes (author doesn't say for sure, unlike later relating how her mother would sue the church regarding Michael, but it wouldn't surprise me if he had been). Eventually the siblings are taken in by some old friends of her mother's, who believe it is a "temporary" situation. "Temporary" becomes years. Michael commits suicide and the author is left adrift as a teenager, feeling abandoned by her mother, dealing with the loss of her brother and being unwanted by her guardians. Yet, despite it all the author never throws herself too many pity parties, just says this is what happened. As a memoir it was extremely compelling read. But as she moved onto adulthood, I found the book less and less interesting. Food/cooking memoirs are a real mix for me. I adored books by Ruth Reichl or Marcus Samuelsson. But with another rauthor (Molly Wizenberg) who is closest in terms of parallels to this author (a food blogger and not a chef or food critic who then writes a book or two) I felt the same. Sometimes blogging really doesn't carry over into book form all that well. Perhaps it's because I'm not familiar with her blog (based on other reviews though, not all of her blog readers were happy either) but I honestly didn't find the project particularly interesting. As a memoir of her childhood and younger days I applaud the author for coming out on the other side in what definitely seems to be a much better place. But a look at her food project it wasn't at all interesting for me. I'm sorry to say this is more of a 2.5 star review. I'm a bit of a sucker for food memoirs and was excited to receive a copy of this at a recent Book Buzz in NYC. The sales pitch revolved around a woman who decided to cook a meal from every country on Earth over the course of 195 weeks. "Great", I thought "I have a friend who is doing a very similar thing for her family, let's compare." I did not know that the author was already a bit of an NPR star. With every food memoir comes a bit of family history and background to put the food into perspective, and this is where this book lost me. The first two thirds of the book are about an awful childhood, rebellious teen years and the road to some semblance of adult normalcy. There are a few requisite recipes thrown in to the story, but they are pretty pedestrian. Then, when we finally get to the big life changing project, the narrative becomes scarce and the global recipes take over. The last hundred pages are more of a cookbook with stories attached to the recipes. So maybe my disappointment lies with my perceptions of the book going in. I wanted the book to be mostly about the Global Table Adventure, not the author's troubled youth. That could have been a separate book if the book I'd envisioned was a hit and people wanted to know more about Sasha Martin. I'm left with the feeling that I should've read her blog first, so I suppose her fans and followers will have a different perspective. I read this mostly in one sitting while stuck in a quiet hairdresser's chair. I found myself closing the book and taking periodic breaks because of the sheer intensity of food blogger Sasha Martin's childhood, detailed in this memoir. Martin writes well, and her story is beyond compelling. Her mother is, to put it kindly, a piece of work -- but Martin's love for her shines through, even while her free-spirited mother makes a series of disastrous choices. You can feel the mercy in Martin's writing I read this mostly in one sitting while stuck in a quiet hairdresser's chair. I found myself closing the book and taking periodic breaks because of the sheer intensity of food blogger Sasha Martin's childhood, detailed in this memoir. You can feel the mercy in Martin's writing; her descriptions of people's actions are unflinching yet her interpretations are charitable. The instrument of Martin's redemption and her tools for forgiveness come in the form of her food blog, http://globaltableadventure.com/, and her family. She weaves a variety of recipes into her book, and I'll be keeping this library book for bit, so I can experiment with a few of them, including her German tree cake. The final sections of the book, where she starts the blog, cooks foods from a variety of different countries and then holds a giant global cuisine party in her adopted hometown of Tulsa, Oklahoma, is comparatively rushed -- but her happy life with her toddler daughter and new husband has a different kind of poignancy. I first found Sasha's blog some years ago and as I read through her posts each week, I always had questions. This book answered those question. I finally got to understand the lady behind the blog. She writes about an almost unbelievable childhood that has you quickly flipping the pages to find out what will happen next. I loved her writing style and it was hard to put the book down as I wanted - no, needed - to know where life would take her next. There are recipes included along the way but ma I first found Sasha's blog some years ago and as I read through her posts each week, I always had questions. This book answered those question. I finally got to understand the lady behind the blog. A wonderful book of love, forgiveness and great food. What's not to love? This was one of those books that I found myself reading at stoplights, on the elevator at work, any spare moment I could find. The book is one part The Glass Castle, one part Julie and Julia, with a twist of Gourmet magazine to finish it off. It has very little to do with the culinary adventure associated with cooking the world and, while it includes recipes, it's decidedly not a cookbook. This is the story of what leads Sasha Martin to explore world cuisine and ultimately find the connections an This was one of those books that I found myself reading at stoplights, on the elevator at work, any spare moment I could find. The book is one part The Glass Castle, one part Julie and Julia, with a twist of Gourmet magazine to finish it off. It has very little to do with the culinary adventure associated with cooking the world and, while it includes recipes, it's decidedly not a cookbook. This is the story of what leads Sasha Martin to explore world cuisine and ultimately find the connections and roots she has been searching for her entire life. Martin's childhood is tragic. She is abandoned over and over again. But somehow she escapes with fewer scars than one might think. I think this book (even more than her cooking project) served as the therapy she desperately needed to finally heal. It's still clear, however, that she's not ready to face some of the truths about her own past. Even as an adult she seems to constantly try to smooth things over for her own mother while her mother seems content to sweep the past under the rug and never really take accountability for the fact that the choices she made (which may have been with the best of intentions) damaged her children. I would love to read her mother's memoir, as I think there is so much to her story that the author either didn't include or more likely probably doesn't know. Sasha Martin's book Life from Scratch is a book that is both wonderful, fascinating, and heart breaking. Martin did not have the easiest childhood. It seems that challenge after challenge plagued her and her family. And yet, at the same time, she was living a fantasy life: spending time in France and other countries. Seemingly having everything. And yet, having nothing. But her earliest memories are being in the kitchen with her mother. 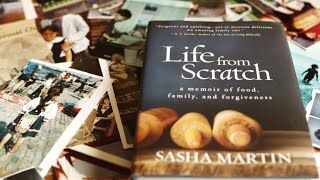 And as she grows, she is able to reconnect through food and Sasha Martin's book Life from Scratch is a book that is both wonderful, fascinating, and heart breaking. But her earliest memories are being in the kitchen with her mother. And as she grows, she is able to reconnect through food and undertakes the challenge of cooking food from every country in the world for her family and friends. This is one more memoir of a difficult growing up followed by a successful struggle to find happiness and personal fulfillment. Sasha’s triumph comes in the form of a popular food blog featuring international recipes which culminates in a public banquet with a dish from every country of the globe. I think I have read too many of these types of memoirs because this did not impress me, neither in the life story nor in the writing. I seem to give a lot of books five stars, but the ones I've read recently deserve them. This was a wonderful, warm and tasty read. Although the author's childhood was a trifle hard to read about at times, the book ends with her having found the contentment that she sought. That makes the book sound simplistic, but it is a rich, complex read. I highly recommend it. LOVED this book! I couldn't put it down! Finished it in one day! The author's narrative of her life drew me in from her introduction right through to her last page. I loved her mother's practical and empowering child rearing philosophy. I kept having to stop and read aloud sections to anyone handy. Here's an example found in chapter 1 "Living Room Kitchen", page 24. (I'll leave out paragraphs and quotation marks) "I must have been five when I told Mom that I wanted to make the roast lamb I'd seen Julia make on T.V. OK, she said, Write down what we need to do. The author's narrative of her life drew me in from her introduction right through to her last page. I loved her mother's practical and empowering child rearing philosophy. I kept having to stop and read aloud sections to anyone handy. Here's an example found in chapter 1 "Living Room Kitchen", page 24. (I'll leave out paragraphs and quotation marks) "I must have been five when I told Mom that I wanted to make the roast lamb I'd seen Julia make on T.V. OK, she said, Write down what we need to do. But I don't know how to write--. Nonsense, she said and handed me a slip of paper and a pencil. I filled the small sheet with graphite waves--my first recipe. Mom sat behind me and jotted down the basic instructions. To pay for the ingredients we collected change in an old jelly jar, Michael helping me scour the sidewalk for pennies. A few months later, once we had enough, we bought the lamb and a one-ounce jar of mint jelly just in time for Easter." On page 25, several paragraphs later she writes, "Fueled by Mom's inventiveness my imagination grew unchecked. No meal was beyond the realm of possibility. .... If we lacked the time or the means to make a dish Mom would hand me a pencil and butcher paper. No reason to go without, she'd smile. Draw it -- make me hungry! When I was done she'd feast her eyes on my crude illustrations as though the graphite lines formed an edible banquet. Her inevitable approval always came with one word, exclaimed loud enough to make me jump: YUM!" Warning: There are plenty of tough times and difficult choices to come as she eventually finds herself in the foster care system and later living with a court designated guardian. I won't be surprised if this is made into a movie -- it is that good. And compelling. She acts on her inspiration to cook a dish from every country in the world -- one country a week, and decides to blog her journey. Interspersed throughout her story are nearly thirty recipes (easily found again using the index at the back of the book). They are very easy to make (if I can make them anyone can). I highly recommend the Dark Chocolate Guinness Cake with Baileys Buttercream. Ahem. I didn't have any Guinness or Baileys on hand so I substituted coconut milk. This "Global Table Journey" takes on a life of its own, with so many coincidences that one wonders about the power of attraction. In fact, her journey eventually gets national television attention and is celebrated by an impossibly huge community event. Inspiring? Yes! I heard Sasha Martin speak at my local bookstore recently. Prior to that, I didn't know anything about her and had never visited her food blog. In person, she was down-to-Earth, funny, warm and cautiously open about the struggle that had gone into writing this book. It was clear she had a story to tell, and it wasn't just about food. This author had a hell of a childhood. Reading this book reminded me of reading The Glass Castle, where you just want to shake the adults who are totally failing the I heard Sasha Martin speak at my local bookstore recently. Prior to that, I didn't know anything about her and had never visited her food blog. In person, she was down-to-Earth, funny, warm and cautiously open about the struggle that had gone into writing this book. It was clear she had a story to tell, and it wasn't just about food. This author had a hell of a childhood. Reading this book reminded me of reading The Glass Castle, where you just want to shake the adults who are totally failing the children that need them. It must have been really difficult for Martin to revisit her younger years when she was writing this book. She is clearly still processing everything that's happened to her and trying to work through it. I really admire that she's candid here about the fact that she hasn't put everything behind her and these kinds of scars don't really heal. That said, she's an incredibly positive person, and her love for her family, food and community resonate on every page in later chapters. I found her desire to "cook the world" really charming, and the way it brings her town together and engages them in a multicultural adventure is very sweet. The writing was good. But I felt like I was mislead about the story. The description says: "Over the course of 195 weeks, food writer and blogger Sasha Martin set out to cook—and eat—a meal from every country in the world. As cooking unlocked the memories of her rough-and-tumble childhood and the loss and heartbreak that came with it, Martin became more determined than ever to find peace and elevate her life through the prism of food and world cultures." I expected the book to be about 195 weeks The writing was good. But I felt like I was mislead about the story. The description says: "Over the course of 195 weeks, food writer and blogger Sasha Martin set out to cook—and eat—a meal from every country in the world. As cooking unlocked the memories of her rough-and-tumble childhood and the loss and heartbreak that came with it, Martin became more determined than ever to find peace and elevate her life through the prism of food and world cultures." I had to skim a lot of this book. This lady had such a tragic past. I want more of the trials and tribulations/journey of cooking a meal from every country of the world and less about the author's tragic childhood. This book should really be re-marketed as more of a straight memoir. I loved the last 1/4 of the book -- the actual food part -- and wish it had been woven throughout the the rest of the text. If past and present were written together, rather than a chronological telling of the author's life, with the food memoir part shoved in at the end, I would have really enjoyed it. The writing was very good and I think the author had a story that needed to be told, but the way it was presented was definitely not "food memoir." This memoir was at times sad, depressing and uplifting. This was the author's life and at the end of it I felt like she was a friend. I liked her way of telling her story interspersed with food and recipes pertinent to the story. Overall this is Meh. I'll give it 1.5 stars. I read just over 200 pages before I put the book down. It is more autobiography than food lit. Mediocre writing and gliding over subject matters introduced in first 1/3 of the book didn't sit well with me. Another "memoir" from a food blogger who had a rough upbringing, finds food, finds love, finds fulfillment. Interesting concept for her blog and I'll go check that out, though. Not bad at all, just not great. Sasha's work has been featured on NPR, as well as in Whole Living, Bon Appetit, The Smithsonian, The Hu SASHA MARTIN is an award-winning writer and blogger who spent almost four years cooking her way around the world. She graduated from Wesleyan University and was an MFK Fisher Scholar at the Culinary Institute of America. She lives in Tulsa, Oklahoma with her husband Keith and their daughter Ava. Sasha's work has been featured on NPR, as well as in Whole Living, Bon Appetit, The Smithsonian, The Huffington Post, and CNNgo. Her website, Global Table Adventure, is a go-to hub for foodies around the world.